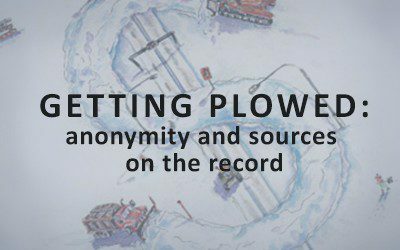 Getting Plowed is a feature-length investigative report about the snow removal industry in Montreal and its “turf wars”. The article was the cover story for the Winter 2011 edition of Maisonneuve magazine. Journalist Selena Ross tells the stories of snow plow employees or private contractors who have had their equipment damaged, lives threatened, and personal harm done to them for bidding on city snow-removal projects that were not assigned for them to win by those in charge of bid-rigging. Getting Plowed was published soon after the release report from Quebec’s independent anti-collusion investigator, Montreal’s former police chief Jacques Duchesneau. In what came to be known as the Duchesneau report, his report was leaked to the press showing a highly corrupt contracting system with Montreal construction. 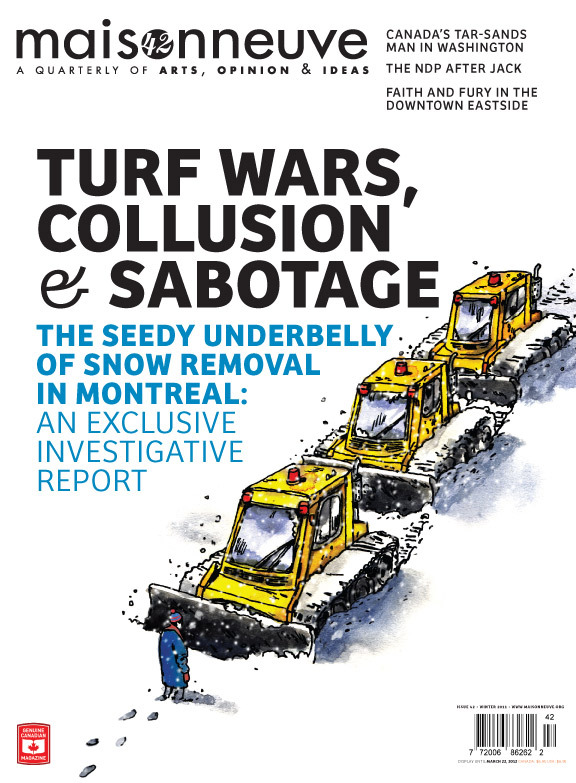 The Duchesneau report only briefly mentions snow removal contracts, calling them “fertile ground for collusion” but did not go into any specific detail in that regard. Selena Ross was a freelance journalist who moved back to her hometown of Montreal soon after graduating from Columbia University’s Graduate School of Journalism in 2009. Upon returning to Montreal, Ross started working as a freelance reporter, but had little experience in terms of crime reporting at the time. Drew Nelles had been with Maisonneuve since 2009 and was appointed the new editor-in-chief at the beginning of 2011. It was his first year at the helm of the magazine, which was on the verge of celebrating its 10th anniversary, and he was Maisonneuve’s first editor-in-chief who was not a founding member. When Ross first started looking into this particular report on snow removal collusion, she was initially researching for a pitch on snow plow safety. More specifically, she was interviewing private snow plow contractors as to why there are so many pedestrians killed by snow plows in Montreal. (The high-profile death of Jessica Holman-Price, who was killed by a snow plow in 2005, led to a campaign in her name that claims there have been over 100 snow plow-related deaths in Montreal since Jessica’s death.) Over the course of interviewing workers about safety-related issues, Ross’ sources told her a lot about collusion in the snow-removal industry. They casually talked about bid-rigging, sabotage and other illegal parts of the industry, as though they were the norm. When she approached Maisonneuve’s editor-in-chief, Drew Nelles, the story about collusion became her new pitch. Considering the pervasiveness of city contracts run by the mob in Montreal, Ross and Nelles would have to deal with the perspective of how to deal with quoting sources anonymously in the story. They realized that many would likely only speak off the record out fear of reprisal that could result in physical harm. They would also have to discuss the idea of sources being put in harm’s way if they were to be quoted with attribution. While conducting interviews, many of the snow plow contractors were happy to talk about the collusion, as they were tired of dealing with bid-rigging and making deals with the Montreal mafia in order to get contracts. However, out of fear for their safety, many insisted on being quoted anonymously. Occasionally, however, some interviewees did not ask to be off the record.